What the hell are Memristors? As words go, it's certainly not the best crafted. Ungainly and unimaginative, 'memristor' belly-flops rather than rolls off the tongue. It is, however, usefully descriptive: because anyone can see that the inelegant portmanteau has something to do with 'memory' and 'resistance' from the off. Like the three passive elements of an electrical circuit – resistance, capacitance and inductance – it's a measure of certain electrical properties of a component. It wasn't brought up in GCSE science, though, because no-one has ever seen or built a memristor before now. A material with memrisistance – even clumsier as an abstract noun – acts like a traditional resistor, throttling current flow in an electrical circuit. It's hugely significant for the computing world, because a memresitor retains all information about its state after it's been powered down. Unlike other forms of non-volatile memory, such as fl ash or magnetic media, a computer memory format based on memristor technology would be fast enough to use as system RAM. A memristor is also much simpler and smaller than a transistor – all its properties are in one wire. Because it can have variable resistance, rather than just an on/off state, it also has profound implications for analogue computing and applications like neural simulation. Essentially, the memristor opens the doors to instant booting machines, with superfast RAM access and very low power requirements. 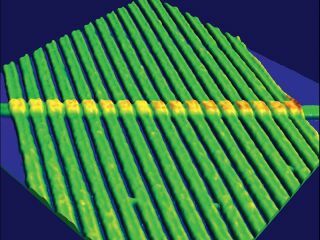 Even better, says the team currently leading research into memristor technology, it looks like the materials and processes for fabricating a memristor aren't too dissimilar to those that are used in current microchip production lines. The concept of a memristor was first mooted in 1971 by Professor Leon Chua of University of California, Berkley. He speculated that there was a missing property in the sets of equations that define charge, current flow, voltage and flux of a circuit, and that it would therefore be defined by memresistance. Although memresistance properties have been witnessed in labs for some time – both knowingly and unknowingly – it wasn't until the end of last month that researchers at HP's Palo Alto Labs announced that they'd built a nearperfect example of a switching memristor that could replace a conventional transistor. This was the first time that the theory could be proved unambiguously true. The breakthrough, it seems, was in the size of the materials they could work with. Memresistance occurs because atoms shift as current is passed through them. Therefore by creating wires just a few atoms in width, it was possible for the first time to isolate the effect. The HP team's work has been verified and published in the peer-reviewed journal Nature, where researchers stated that memristor technology, can actually recall and make associations between events that are similar to how a human brain recognises patterns. On that basis it looks like the wait could finally be over; and the time has come to start practising that awkward sounding word and start singing to everyone the praises of the rise of the mighty memristor. The lay-out of the memristors, shown in the picture above, is being dubbed a 'crossbar latch' by HP and is the basic design for using memristors as transistor replacements. Voltage across the main line in the centre of the image is controlled by the memristors, which can be used to simulate logic gates. At present, though, the switching speed of the memristors is only around a tenth of the speed of DRAM. When it comes to data storage abilities, things are already looking very promising. HP's prototype has a memory density of around 100Gb/ cm2, or around three times that of the current fl ash memory standards available today.